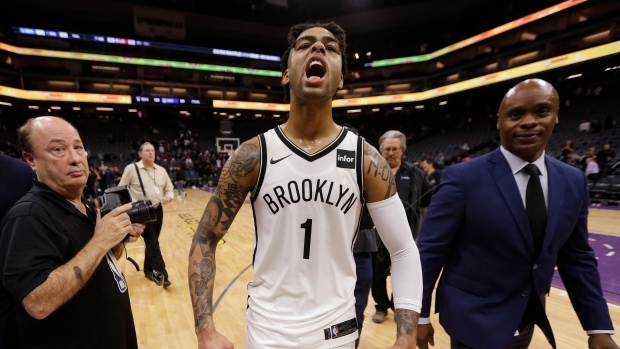 SACRAMENTO, Calif. — Brooklyn coach Kenny Atkinson tried just about everything to kick the Nets into gear. There were quick timeouts, angry, animated discussions with his players and even switching from man to zone defence. After scoring 17 points in the first half and going without a point in the third quarter, Russell shot 10 of 15 in the fourth quarter, repeatedly burning Sacramento's defence with quick drives to the basket. He scored 16 straight points during one stretch while getting plenty of help from his teammates. "Once you get in that groove it's hard to get you out of it," Russell said. "No matter what defence a team throws at you, you're going to find a way to get it done. That's kind of what it was." "We relaxed and were very casual," Kings coach Dave Joerger said. "Didn't run back on defence, turned the ball over a ton and took a lot of jump shots because we thought it was going to be easy." The Kings led by 28 points and shot 51.6 per cent from the floor. "The coaching was terrible," Atkinson said. "The zone was terrible. I used up my timeouts. They never responded. We put a group of players out there that have a great bond and a great spirit and were working their tails off behind closed doors. It was 100 per cent on them. That's player ownership."